Begin your journey to enlightenment on the golden bays of Cascais. The Salty Pelican is run by three backpackers who have poured their heart and soul into creating an easy-going, beachy retreat where you can leave your cares at the door. 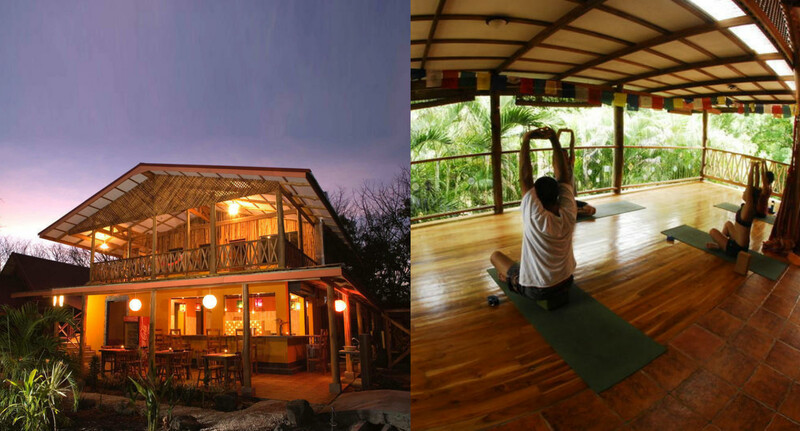 There’s yoga for all levels with sunrise Yang Yoga and afternoon Yin Yoga taught every day by the hostel’s in-house instructor. You can even switch it up and get your sun-kissed beach bums on a surfboard by signing up for their daily lessons at the beach. But make sure you return for the BBQ feast on the hostel patio after sundown! Whether you’re on the cosmic road to divinity in Varanasi or prepping for the Holi Fest in Pushkar, you can always rely on a Zostel for friendly hospitality. They may have 16 hostels across India, but each one has its individual charm. Fairy lit pool? Try Zostel Pushkar. Majestic views? It’s got to be Zostel Jaisalmer. High quality yoga? ALL Zostels are yoga hostels! 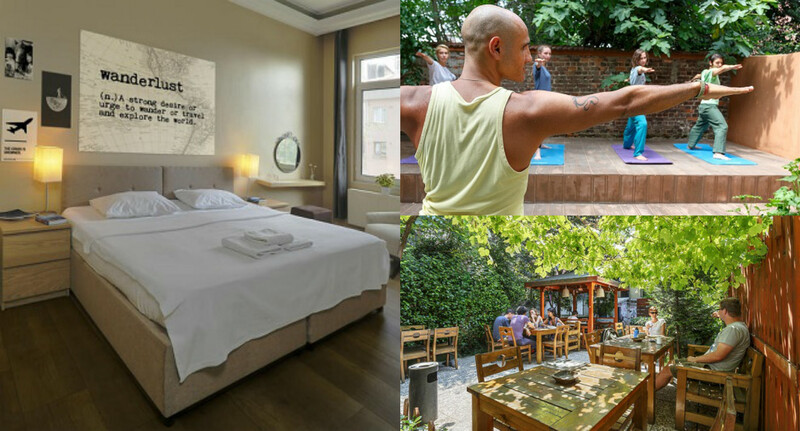 We particularly recommend Zostel Manali for its yoga lessons in the garden, with a rather nice view of the Himalayas. Freehand Miami is all about health and hedonism, and attracts a sociable but laid-back crowd. We suggest kicking off your week with Monday Mantra Yoga on the beach followed by a post-work out happy hour at the award-winning hostel bar, The Broken Shaker. Next try a rejuvenating sesh of Weekend Detox Yoga, followed by Salsa lessons & the Chocolate Shaker pool party on Sunday to retox, retox, retox! The name says it all! 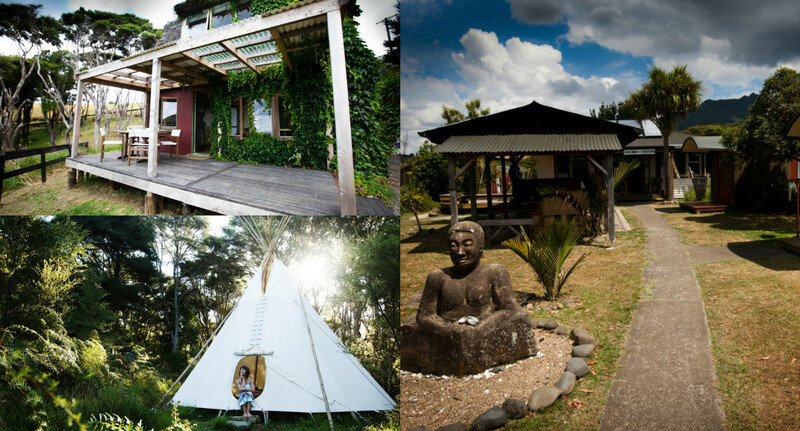 You’ll find activities and yoga coming out of your eyeballs at Solscape Raglan with Mindful Yoga, Acrobalance, Surfcentric, Slow flow Yoga, Yin Yang Yoga, and you can even opt for private lessons or the retreat package. We love the unusual accommodation choices too – choose from a caboose, classic 1960’s kiwi cottage, a converted train carriage, or go tribal in their tipi Village! Insider tip: bring pizza ingredients because there’s a brick oven in the communal kitchen. LEGIT. Do you smell that? It’s the fragrant scent of the orange, pear and pistachio trees that surround this oh-so-heavenly hostel. Caveland is in the heart of Santorini but off the beaten path, a seriously Greek complex of 8 caves housed in a former 18th century winery. The owner just so happens to be a Yoga instructor, and teaches classes on the terrace facing the Agean Sea. It’s ideal if you want a peaceful sanctuary with a few breakfasts, dinners and BBQs thrown in to socialise with other travellers. Yoga. Surf. Beach. Repeat. Simply put, life is sweet at Casa Zen. It’s a few minutes’ walk from the famous Playa Santa Teresa, and everything nature-tastic is nearby from waterfalls to diving sites to horseback riding. Enjoy yoga classes on the hostel deck every day, and if you like high intensity workouts, our customers rave about the Cardio Fit class. Casa Zen has the food thang down, providing a free breakfast every morning and there are two communal kitchens complete with blenders for your green shakes! 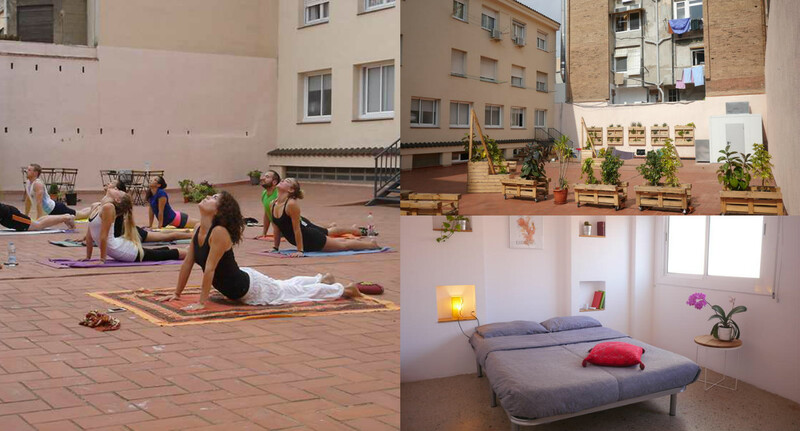 Rooted in the boho neighbourhood of Gracia, Jam is a quality hostel with quality yoga. There are yoga classes every morning on the terrace taught by an expert instructor who practices Shri Vivek Yoga – “postures, breathing, kriyas, bands, movement, expression, cleansing the chakras and mantras.” All that for €5 a class? Get us some of THAT! Sun salute on the rooftop of this hostel overlooking Mirissa Beach and let the tropical breeze awaken your senses. Hangover Hostel is proof that paradise is affordable – not only are you surrounded by coconut trees and alabaster beaches (hello 9.7 location rating! ), but you get the family vibes of a hostel with morning yoga, nightly entertainment and legendary staff. It’s no surprise it won the award for best hostel in Sri Lanka at this year’s Hoscars then! ? The 9.2 superb customer rating doesn’t lie. Hush Hostel Lounge is situated in Kadikoy, a hipster district on the shore of the Sea of Maramara aka the “Asian Side” of Istanbul. You’ll find tattoo shops, street art, and some of the best bars and markets in the city. Hush is a peaceful little oasis hidden in this lively neighbourhood. There’s free breakfast, a terrace with a Bosphorus view, and a pretty garden where they do yoga classes. All that sea, tea and peace for under a tenner per night ain’t bad! Get out of your thermals and into your spandex at Loft Hostel! Viktor, a yoga instructor and dancer, will be waiting to guide you through your free yoga sesh every Sunday afternoon, all year round. And the activities don’t stop there. This super-hostel hosts everything from clothing markets, cabaret nights and even a knitting club! Rest assured that the Loft lives up to its 9.8 location rating: it’s walking distance of literally everything, and the rooftop is prime aurora-spotting territory by night. Kerching! A jack of all trades, this hostel has every activity imaginable – wine and cheese tasting, ice skating, food truck party, gospel choir (no joke)…you name it! Our highlights are the all-you-can-make breakfast pancakes and the free yoga classes every Tuesday at a Cathedral across the road. This obviously counts as balancing your Yin and Yang. Having many companions is much more helpful to keep you motivated in continuously do yoga. 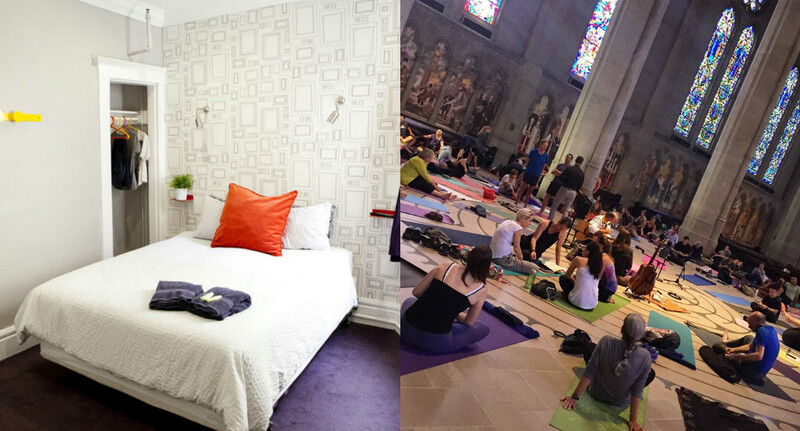 Thank you for sharing this different hostel that you can do yoga as well. You guys are missing the beehive at Holistika Tulum, coolest hostel in the world! !